It’s finally Friday – yahoo! One. Snow – That’s right… it’s early April, the first day of Spring was a couple weeks ago and here in Northern Virginia…Winter will not let go! Earlier in the week the Weather Channel was forecasting a 100% chance of snow; 5-8 inches of accumulation and I definitely was feeling about the same as Jon Snow is below… Well now the snow chance has decreased to 80% and they are predicting just 1-3 inches of accumulation. Either way, any snow in April is too much snow for me! Update – now the snow chance is gone! So maybe I won’t be looking like Jon Snow tomorrow? All the praise hands! Two. Free Shipping – Today and tomorrow only, Perfectly Posh is offering free shipping on all orders over $25! Perfectly Posh has a lot of great deals going on right now but free shipping on orders over $25 is great – you can try out a couple products and get them sent your way for free! If you’ve ever wanted to give Perfectly Posh a try – now is the time! You can head over to my website at http://NatalieSummerlin.po.sh and check it out for yourself! Three. Cherry Blossoms – The cherry blossoms are at peak bloom! Amazingly all the crazy weather fluctuations haven’t hindered them too much and the tidal basin is currently ringed in pink petals! Seeing the cherry blossoms is one of my favorite things and if I have the chance, I love get to DC and take them in – even if it’s insanely crowded! I don’t think it’s in the cards this year…but as another blogger I follow pointed out, at least I have gorgeous pictures from previous years to look at! Four. The Maryland Symphony – Sunday afternoon I’m going to the symphony and I’m quite excited! 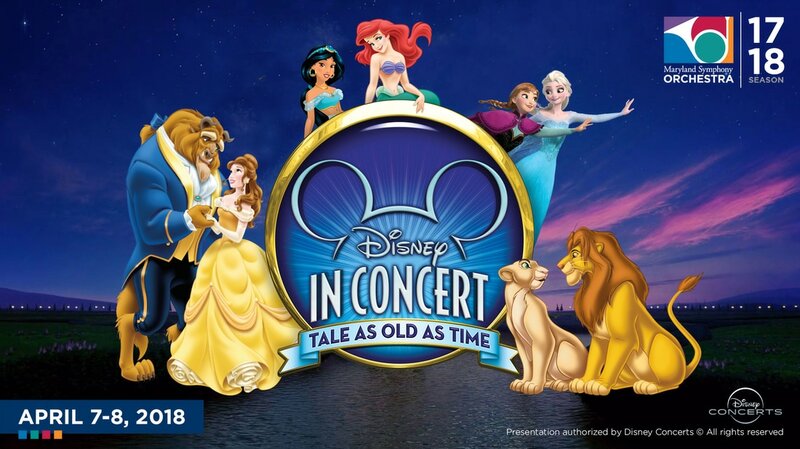 The Maryland Symphony is putting on a concert composed of some of the best known songs from Disney movies and we all know I’m a big ol Disney nerd! Some of the songs that are included in the performance are a Tangled medley, and Enchanted Helpers medley, a Villains medley…and so much more! There will be giant screens to go along with the music and I just know it will be spectacular! Five. Nationals Baseball – The Nationals actually have today off but they’ve already got seven games under their belt for the 2018 and their record currently stands at 4-3, so we’ve won (one) more than we’ve lost. Adam Eaton was named NL Player of the Week for the first week of baseball and Bryce Harper seems bound and determined to prove anyone who calls him overrated wrong – my first game is next Friday and I can’t wait for more afternoons and evenings spent at the ballpark! That’s this week’s Five on Friday – if you have a blog and want to join in, feel free to post about five things on your mind this Friday…or five things you’re loving right now…really just five of anything YOU want to talk about and share! I hope everyone has a wonderful weekend – the first weekend in April!